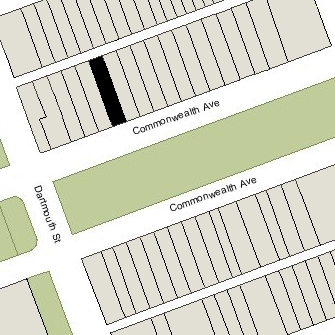 129 Commonwealth is located on the north side of Commonwealth, between Clarendon and Dartmouth, with 127 Commonwealth to the east and 131 Commonwealth to the west. 129 Commonwealth was built ca. 1871, one of a symmetrical pair of houses (127-129 Commonwealth). 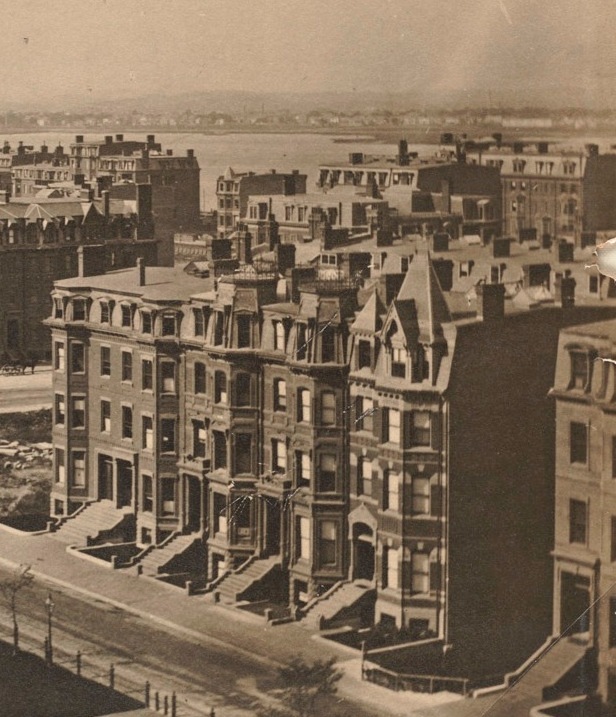 The land for 129 Commonwealth was purchased from the Commonwealth of Massachusetts on April 20, 1868, by Miss Elizabeth Chipman Gray, and the land for 127 Commonwealth was purchased on the same day by her sister, Miss Harriet Gray. 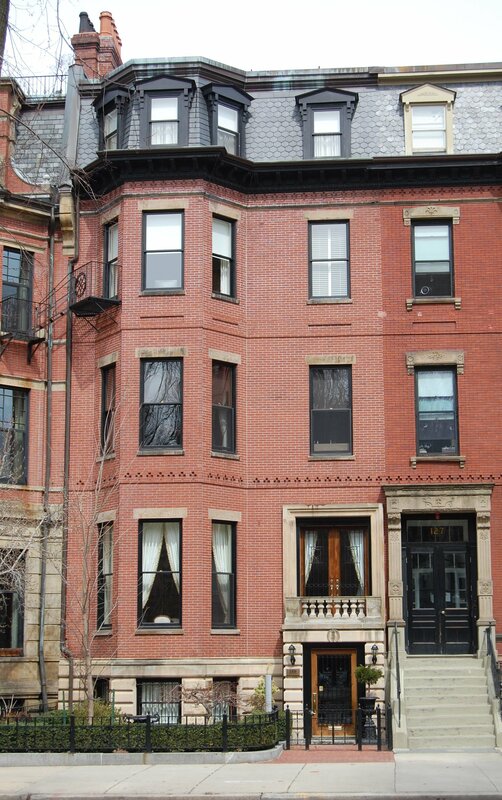 They lived at 143 Beacon with their father and step-mother, Horace Gray and Sarah Russell (Gardner) Gray. On July 2, 1868, wholesale dry goods merchant George Howe purchased both lots, and on October 7, 1870, he sold the lot at 127 Commonwealth to William Fletcher Weld and the lot at 129 Commonwealth to Charles Mayo Ellis. Click here for an index to the deeds for 129 Commonwealth. Charles Ellis and his wife, Helen (Thomas) Ellis, built their home at 129 Commonwealth. They previously had lived in Jamaica Plain. Charles Mayo Ellis was an attorney and early abolitionist. In 1854, he had acted as counsel for Anthony Burns, the fugitive slave whose arrest in Boston under the Fugitive Slave Act became a major abolitionist rallying point in New England. 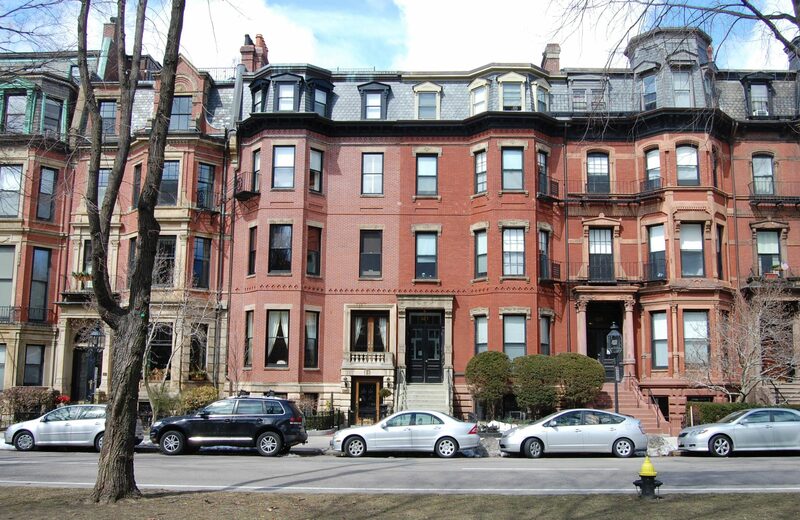 Charles and Helen Ellis continued to live at 129 Commonwealth during the 1876-1877 winter season, after which they moved to Brookline. 129 Commonwealth was shown as vacant in the 1878 Blue Book. Charles Ellis died in January of 1878 and 129 Commonwealth was inherited by his four children: Charles J. Ellis, Theodore Ellis, and Effie Ellis, who were his children with his first wife, Harriet (Lewis) Ellis, and Helen T. Ellis, who was his daughter with his second wife, Helen (Thomas) Ellis. On November 15, 1878, Theodore Ellis, who lived in New York City, transferred his interest to Helen (Thomas) Ellis. By the 1878-1879 winter season, 129 Commonwealth had been leased by Abby (Howard) Manning, widow of wool merchant Francis Cogswell Manning. Their daughters, Abby Frances Manning and Anne Faulkner Manning, lived with her. 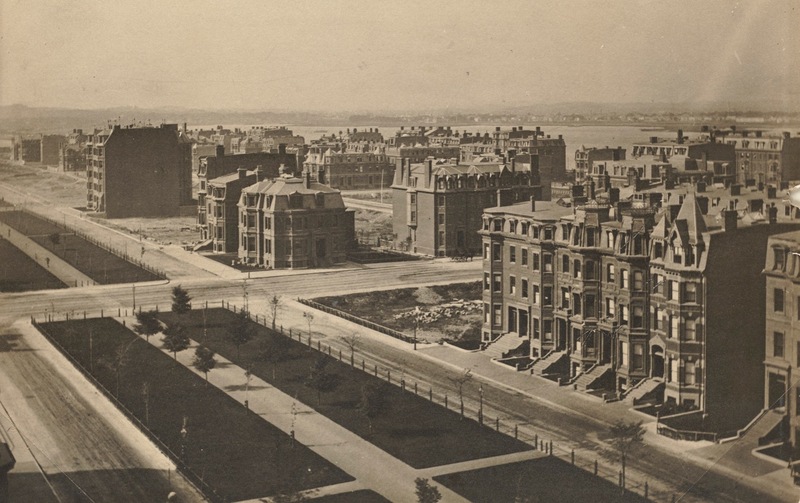 In 1874, they had lived at 128 Beacon. Helen (Thomas) Ellis died in December of 1878 and in March of 1880 Abby Manning acquired 129 Commonwealth from her estate and from Charles Ellis’s heirs. Abby Manning died in July of 1905. 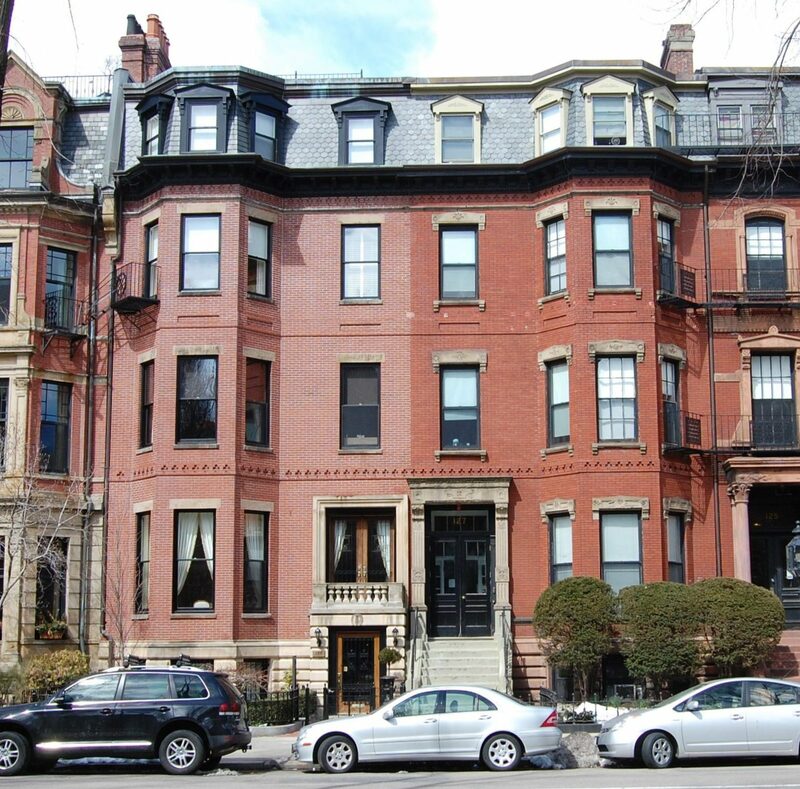 She left 129 Commonwealth to her daughters, Abby and Anne Manning, who continued to live there. Anne Manning married in 1910 to attorney George Shepley Selfridge. After their marriage, they lived at Haddon Hall at 282 Berkeley. By the 1916-1917 winter season, Abby Manning had been joined at 129 Commonwealth by her brother, Francis Henry Manning, a retired wool merchant. He was a widower and previously had lived at 356 Beacon. He continued to live at 129 Commonwealth until his death in October of 1922. Abby Manning continued to live at 129 Commonwealth until her death in April of 1925. She also maintained a home in Bar Harbor. The house was not listed in the 1926 and 1927 Blue Books. On June 18, 1926, 129 Commonwealth was purchased from Anne (Manning) Selfridge by banker Arnold Welles Hunnewell. He and his wife, Mary Copley (Amory) Hunnewell, made it their home. Prior to occupying the house, the Hunnewells had it remodeled, including lowering the front entrance to street level. The remodeling was designed by Bigelow and Wadsworth. Plans for the remodeling are included in the City of Boston Blueprints Collection in the Boston Public Library’s Arts Department (reference BIN P-22). While 129 Commonwealth was being remodeled, Arnold and Mary Hunnewell lived at 261 Commonwealth (it had been built by his parents and, in the 1920s, was the home of his unmarried brother and sister, Francis W. Hunnewell and Louisa Hunnewell). They moved to 129 Commonwealth by the 1927-1928 winter season. The Hunnewells continued to live at 129 Commonwealth until about 1933, when they moved to Natick. He continued to own 129 Commonwealth and lease it to others. During the 1933-1934 winter season, it was the home of Frank Jenkins, an investment broker, and his wife, Frances Converse (Gould) Stearns Jenkins. Their primary residence was in Brookline. Living with them was Rose Gordon Stearns, Frances Jenkins’s daughter by her previous marriage, to Richard Hall Stearns, son of the founder of the R. H. Stearns department store. Rose Stearns had been a debutante during the previous season and the Jenkinses probably leased 129 Commonwealth for her post-debutante season. 129 Commonwealth was not listed in the 1935 and 1936 Blue Books and was shown as vacant in the 1935 and 1936 City Directories. By the 1936-1937 winter season, it was the home of banker Francis Lee Higginson, Jr., and his wife, Aileen Muriel (Johnstone) Higginson. They previously had lived at 215 Commonwealth. They continued to live at 129 Commonwealth until about 1941, when they moved to Wenham. By 1942, Arnold and Mary Hunnewell had resumed living at 129 Commonwealth. Arnold Hunnewell died in July of 1972. Mary Hunnewell continued to live at 129 Commonwealth in 1973, but moved soon thereafter. On July 13, 1973, she transferred the property into a trust for her benefit, administered by her three children: Katherine (Hunnewell) Felton, the wife of Cornelius C. Felton; Priscilla Peele (Hunnewell) Kidder, the wife of George H. Kidder; and Arnold Welles Hunnewell, Jr.
On February 26, 1974, 129 Commonwealth was acquired from Mary Hunnewell’s trust by Robert A. deSousa and his wife, Annette C. deSousa. In June of 1974, Robert deSousa applied for (and subsequently received) permission to convert the property from a single-family dwelling into three apartments. On March 1, 1978, 129 Commonwealth was purchased from the deSousas bv attorney Demarest Lloyd Macdonald and his wife, J. Marianne (Van Praag) Macdonald. On March 1, 1995, they transferred the property into his name. by real estate dealer Charles M. Talanian and his wife, Jane Ann (Abdella) Talanian. In November of 1997, before taking title to the property, Charles Talanian applied to change the occupancy from three apartments to a single family dwelling, and also to construct a garage at the rear with an roof deck on top. The change in occupancy was approved, but the addition of the garage was denied by the Board of Appeal in August of 1998. 129 Commonwealth remained a single-family dwelling in 2016.